The following are some more theraputic treatments that will help heal your pet. Theraplate uses small, circular movements to stimulate muscle contraction and increase circulation. Works from the inside out to yield powerful results with no negative impact to the joints. This dynamic movement is exclusive to TheraPlate and is much more advanced than standard vibration therapy. The TheraPlate is proven to counter the effects of chronic inflammation conditions, speed healing, reduce pain, increase circulation and aid in the prevention of injury. Therapeutic Exercise is an important component of rehabilitation of an injured or arthritic pet. The goals of therapeutic exercise are to improve range of motion, decrease pain, increase muscle mass and strength, improve balance and endurance, and to help prevent any further injury. Exercises are customized to target the muscle groups that need strengthened in each individual patient. Neuromuscular Stimulation is a procedure that applies low level electric current through electrodes applied to the skin to cause a muscle contraction. This technique is used in cases of muscle or nerve damage to build up muscle or to prevent the wasting or loss of muscle. It can be used to help with pain by causing the muscle to fatigue or fail, which blocks pain receptors. Uses of NMES are to increase muscle strength, prevent muscle atrophy or wasting, increase joint range of motion, decrease edema, decrease pain, and increase circulation and motor control. Therapeutic Ultrasound uses sound waves to stimulate and heat tissue. The increased tissue temperatures can increase metabolic and physiological effects of cells, which can increase blood flow and pain threshold and decrease muscle spasms. Indications for therapeutic ultrasound include: soft tissue scarring and contracture; inflammation; pain from trigger points and muscle spasms; tendinitis and bursitis. Game Ready® Equine is the secret weapon of top riders and veterinarians for preventing injury in their horses and speeding recovery from a multitude of ailments. 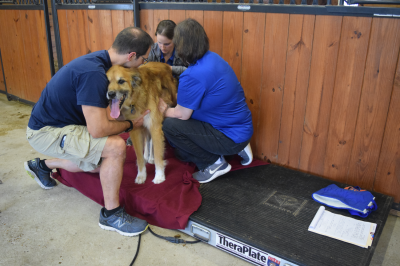 The Game Ready System is used for post-workout therapy, chronic lameness, acute lameness, cellulitis, tendinitis, pre- and post-operative care, bowed tendons, stocked-up legs, wind puffs, and more. Delivering dry cold and active compression, Game Ready Equine utilizes the same physical therapy and athletic training principles relied on by human athletes, calling for the use of RICE (Rest, Ice, Compression, Elevation).